It all went a bit pear-shaped on Saturday. The plan was to visit the gym (how do think I maintain a body like this – magic ?) 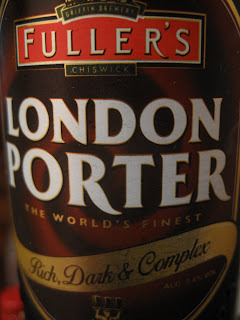 , then visit somewhere for lunch with a swift return home to watch the FA Cup Final. A simple plan but ruined by an overindulgence in a mystery liqueur purchased on a recent trip to Lisbon and YouTube inconveniently having all my favourite music of all time ever that demanded to be watched. Result: a longer lie-in than usual precipitating Plan B. A brisk walk down to Borough Market and its attendant hordes to get a couple of pies from Mrs King’s. A brief chat with Ian Hartland and I walked away clutching one Pork Pie, some Piccalilli and one of Mrs Kings Steak and Kidney Pies. Re the latter you’ll recall HS’s post about being a judge at the 2009 British Pie Awards where he had the honour of judging the Vegetarian category (you can laugh but I had to deal with the fallout). Anyway, Mrs King’s PP was awarded a Gold medal but their S&K Pie made by Hartland junior was a Champion in its class. 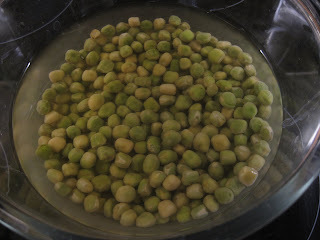 Once I got back the all-important marrowfat peas went into boiling water with some bicarb. After an overnight soak I cooked them nice and slowly until they broke up and became, well, mushy. 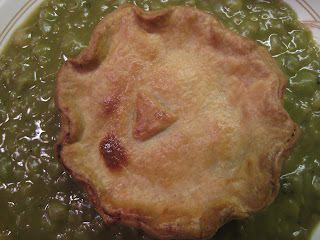 The pie was heated through and placed artfully on top of the peas. 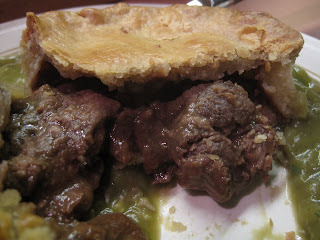 An excellent pie with plenty of chunky meat within but even better was the pastry, all flaky and delicious. 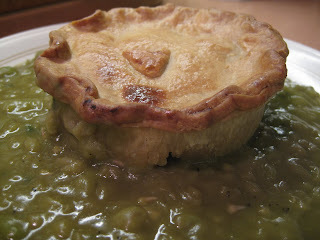 Pie, Peas and a Pint – perfect (sorry just too tempting...the food I mean). Sod the gym, this looks like my idea of heaven - have you ever had a mushy pea fritter? Apparently they're very popular up north. I don't remember our local chippy in South Yorkshire doing mushy pea fritters. 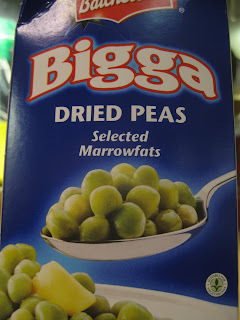 I like the sound of them though - you could have mushy peas two ways. Presumably they come in batter ? I also remember having potato three ways: Chips, Meat and Potato Pie and Scallops. No wonder it's not difficult to spot Northerners when they come to that there London. They're a dying delicacy apparently so only found in the most old school of places. Indeed they do come encased in a crispy batter, protecting the delicate "reduction" of mushy peas within...Those potatoes sound spot on. I really ought to move to Hull or something. I'm a southerner through and through but I love mushy peas. I usually stir a teaspoon of mint sauce through them (is this heresy?). Ooh there's posh ! Actually I did stir in a few chopped leaves of mint. You know, out of all of your post, all those lofty restaurant accounts; i think I've enjoyed this one the most. wonderful work, chaps.